The entrance to Kilclooney Wood. PROPER and safe access to the Comeragh Mountains is hugely important, but expanding the carpark at Kilclooney Wood would only encourage more to embark on an “unregistered walk”. That’s according to Richie Walsh, Head of Enterprise with the Local Enterprise Office (LEO), who told the Comeragh monthly meeting that one of the biggest issues is that the walk to Coumshingaun is an unregistered walk and doesn’t comply with Sports Ireland criteria. 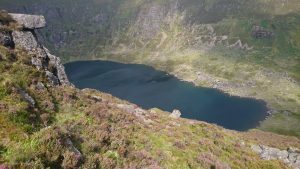 Coumshingaun lake in the Comeragh Mountains. “Therefore to expand the carpark to a certain extent is facilitating access to something that is not properly formulated, and therefore, there’s a bigger piece of work that needs to be done with Coillte, with Curraghmore and with ourselves and Sports Ireland. There are environmental concerns as well because that is a SAC (Special Area of Conservation),” he said. He said access to funding would be possible, but all groups would have to come together to formulate a plan. Cllr Seanie Power said the Comeraghs had become hugely popular since the opening of the Greenway, and the carpark should be extended. Cathaoirleach of the Comeragh District, Cllr Ray Murphy said there were 50 plus cars out on the road, adding that access to the trail is difficult. “Not everyone knows the easiest access route up to Coumshingaun,” he said. In response Mr Walsh said from a liability perspective the Council had to be careful about directing people.